home | HSR Articles | How to Improve Attention to Detail D . . . This review will help you break up the market into three (3) different stock categories to better track market corrections. What's the major benefit of doing this exercise on a consistent basis? You will improve your attention to detail during market corrections. I've learned a lot from my own research and one of the things that's apparent is that attention to detail is very important when it comes to the stock market. When I've missed important events, it's mainly because I wasn't paying attention to the market. Breaking up stocks into different categories will help you stay in gear with the market because you'll be checking each stock category for important facts once a week. This does require weekend work, but weekends are a great time to review the prior week's price action. The market is closed, but the workweek is not over if you want to stay up to date on the market. The main objective is to find out what went on in the market by reviewing as many facts as you have time for during the weekend. Are a majority of stocks hitting new highs? Is there distribution creeping into specific sectors? As mentioned, all of the answers to these and other important questions are found by examining facts. The more facts you review, the more ready you'll be for a potential change in the market's direction. What exactly are facts and why are they vitally important? Facts are simply the price and volume action of the market that's found on a stock chart. The market's price and volume action is equivalent to a majority opinion on a stock because it involves investors from around the world. Therefore, stock charts serve as an unbiased assessment by the majority of investors and are very hard to argue with if you want to be on the right side of the market. Does the market see a stock as bullish (uptrend), bearish (downtrend) or neutral (base/sideways trading)? With this is mind, are personal opinions worthwhile? As you may know, there are many personal opinions on the stock market at any given time. Personal views usually don't reflect the market because they're based on one opinion and include very few facts. That's why they are often wrong. For instance, an individual might be bearish on the market only because they are short a particular stock. Unfortunately, the market may not be ideal for shorting stocks and this reveals that the individual's opinion (bearish) is not based on objective market facts. By examining market facts, you'll always have a majority opinion to consult and that's why stock charts are necessary to get better information on a stock. Think of it this way, would you rather consult one opinion (personal view) or many opinions (stock chart) when your hard-earned money is on the line? 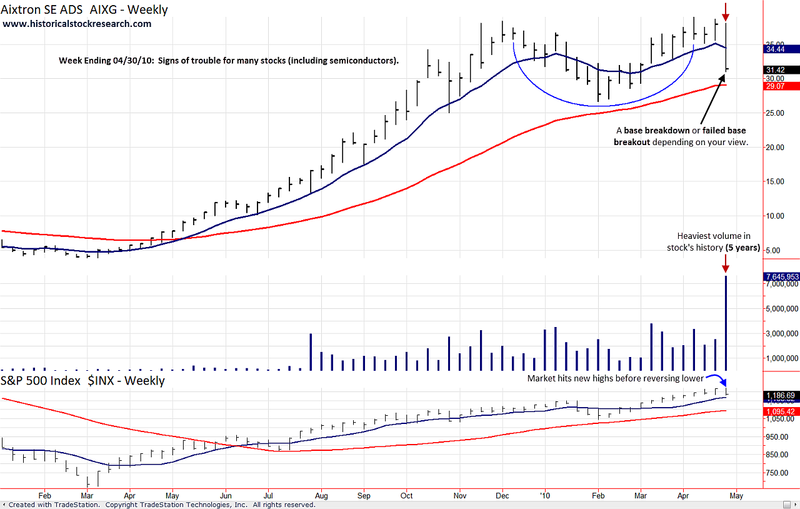 Here's a good example of the importance of market facts (stock charts). Do you remember the May 6, 2010 Flash Crash? 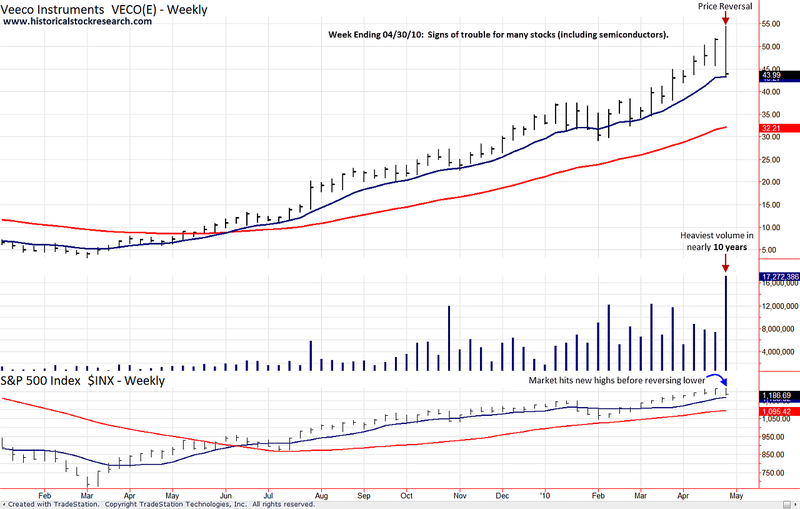 Did you know that there was a lot of distribution (selling) in the market for the week ending 04/30/10? If you'll recall, that was the week before the Dow Jones Industrial Average crashed 1,000 points intraday. Many were caught off guard by the May 6th decline, but the week ending April 30, 2010 was very negative for a market that hit new bull market highs earlier in the week (Monday 4/26). Although May 6th certainly wasn't expected, it wasn't a surprise given the prior week's negative price action. For example, leading semiconductor stocks experienced a significant amount of distribution for the week ending 04/30/10. Former market leaders Aixtron (AIXG) and Veeco Instruments (VECO) are good examples to review. Both were growth stocks focused on producing semiconductor equipment involved in the production of LED lights. Technically, they finished near their lows and showed heavy distribution for the week ending 04/30/10 (see charts 1A & 1B). Specifically, VECO had the most distribution in nearly a decade (10 years) and AIXG had its heaviest volume week since it went public in early 2005 (5 years). That factual information was very important after their large advances and was a warning to heed from the market (majority opinion). As it turned out, the market declined 20% by early July 2010 after the negative price action on 04/30/10. In fact, both VECO and AIXG were in the early stages of topping and eventually fell 65% and 75%, respectively.